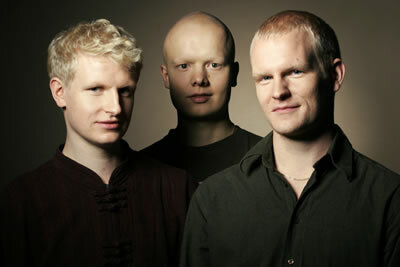 Joona Toivanen Trio - (piano, bass, drums) plays contemporary, intelligent, versatile, and above all lyrical jazz. One of the most promising and talented young jazz ensembles coming out of Finland during the past 10 years. They have a skilful grip on the art of improvisation and know how to deliver a great mix of original compositions with superb musicianship. 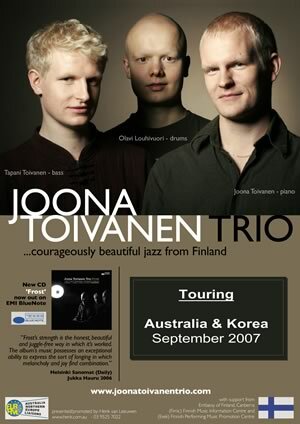 In 2006 EMI Music Finland released the Joona Toivanen Trio’s third album ‘Frost’ internationally on the legendary Blue Note record label. ”The trio’s unique sound is dominated by a certain kind of folk-jazz lucidity. Their ‘Frost’ album is an entity in which ballads are to the fore and whose fabulous compositions conjure up Finnish melancholy and low-spirited emotions, which doesn’t always need to be a negative thing”, - says the album’s producer, J.P Virtanen. Refreshingly lyrical, intelligent and elegant music 3 from the North.